CLEARWATER, Fla. – The Clearwater Threshers have always been involved in the community. Nowhere is this more evident than with the local Little Leagues. The Phillies’ support of youth baseball stretches back decades, and this season is off to a great start. 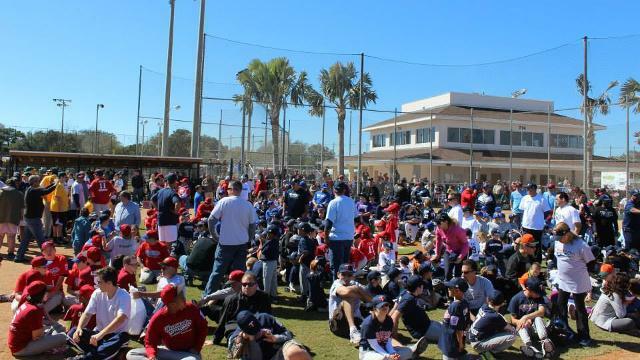 Saturday, Feb. 15, was the reopening of the Sid Lickton Complex and opening ceremony for the 2014 Clearwater Little League season. On hand to celebrate the event was the Threshers’ very own Phinley, as well as Clearwater Mayor George Cretekos, two-time Olympic champion Michele Smith and Phillies’ first baseman Ryan Howard. The Threshers sponsor teams in many local Little Leagues – including Clearwater, Countryside, Safety Harbor, East Lake, Largo, Palm Harbor, South Brandon, and West Pasco Girls Fastpitch Softball. In addition to team sponsorship, the Threshers take part in league opening ceremonies and host end of season parties at Bright House Field. Teams also have the opportunity to participate in Baseball Buddies and accompany Threshers players on the field for the National Anthem. The Threshers also have their Lil Anglers Club, for children 13 and under that meets during every Tuesday Home Game. Some highlights of Lil Anglers Club membership are an official T-Shirt and visor, as well as admission to and a meal deal for every Tuesday home game. Members also can run the bases after and participate in a parent/kid catch before every Tuesday home game. For more information on how to get your team involved, contact Dan Madden at the Threshers, 727-712-4403. This article originally appeared on the official website of the Clearwater Threshers. Click here to view the original story.